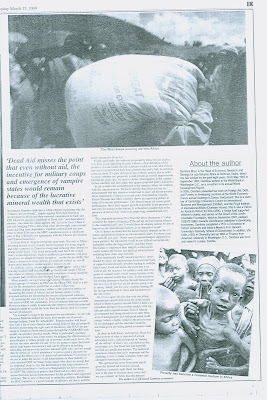 Dead Aid, By Dambisa Moyo ( A Review) mades its way into the sunday edition of The Post as double page spread! The scans below for readers outside Zambia (click to enlarge). Incidentally I am told that in a funny sort of way, the review has sparked interest in folks at home to buy the book! Somehow I don't expect a cheque from Dr Moyo though. Talking of reviews, I trust you are all reading Bad Samaritans : The Guilty Secrets of Rich Nations and the Threat to Global Prosperity our next installment. I hope to get the review out by the weekend or early next week for some lively discussion! This is great Cho, especially as Dr. Moyo was on National Public Radio earlier this week. I have been mailing the scans around and they have been well received. I can just imagine the anti-aid led by Glenn Beck! 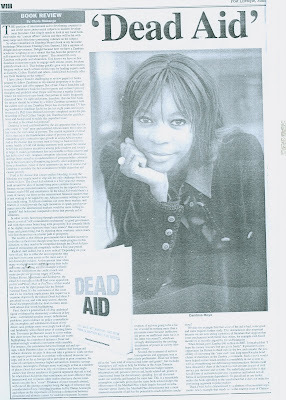 Morning Edition, March 17, 2009 · Steve Inskeep talks with Zambian-born economist Dambisa Moyo about her book Dead Aid: Why Aid Is Not Working and How There Is a Better Way for Africa. Moyo has been a consultant for the World Bank and an economic sub-Saharan Africa specialist for Goldman Sachs. She says American and European good intentions discourage innovation and breed corruption. I'm not sure that I share dr. Moyo's view that chinese investment per se is better than aid. What is needed is a new economic model based on production and internal reinvestment, in my opinion. Why produce for export markets and then import finished goods? Just to put 'donor aid' in it's proper context. The term 'donor aid' makes this shell game sound like we are talking about aunt Millie's sunday 5 pound donation to charity. What we are really talking about, is the continued control of the West over Africa's resources and finances - neocolonialism. There is only one context in which to discuss aid - neocolonialism. So unless economists look at Aid in the other direction - not where it is going, but where it originates - they are not going to understand what is going on. Aid is a neocolonial shell game, which the West is not going to give up just because someone calls for an end to aid. Aid gives the West direct control over Africa's finances, and with that, it's domestic and foreign policies, making it more powerful in the decisionmaking process than it's own population. This is mainly why we have this bad joke of a democratic process, where people just vote once every 5 years but there is no choice between the candidates, because when it comes down to it, they all have the same policy - appease the west, keep the aid flowing, and hope to be re-elected. The stranglehold of aid also means that they will not reform their economies, through massive land redistribution, internal market development, etc. They are falling all over themselves to promise 'continuity', which I think is a codeword for continuing neocolonialism, while safely kicking development out into the long grass of the '2030 vision'. How many 5 year development plans are there going to be? And even then, everyone thinks that development consists of exporting more, instead of producing more. Why does everyone insists that development is about having more goods to export? Even in the BBC report, the person in (I think Northern Province) said - we have so much food we could grow for markets in Asia - how about growing food for markets in Zambia, and the DRC, and SADC? This is a big reason why there is no real economic growth, because people keep looking across their borders, instead of developing safe and reliable markets at home. And that in a great part is the government's and parliament's job. I haven’t had a chance to read every line of Cho’s review of Moyo’s book. Neither have I read the book itself. But based on what I can sense from what is being said - I can summarize my feelings this way: - if “Aid to Africa: Is Not working well”, who says replacing Westerners with Easterners is the best solution? Here I agree entirely with you. Chinese who are themselves still underdeveloped, how can they act as the best ‘fundis’ (teachers) on this issue to us? Hardly! Chinese main and immediate objective is self interest. They’ll pretend to be nice to get what they want – which is raw materials, resources and markets. That is all. If Moyo has offered China as the alternative to Westerners, then she is off. There are some who are already referring to the book as fraud or con – in the sense that it is regarded as a book written by an American/Western protégé. That this is a book by someone who appears to be critical of Westerners but yet protecting them in the process. To compare Westerners who have been dominant aid donors to Africa, versus say, China, which is basically bribing its way into Africa, is not a fair assessment. There was an international news segment on CBC Radio recently, where an expert from Columbia University was asked to comment on Moyo’s book. This guy (I’ve to get the name) appearing on Dispatches basically summarized that – Moyo’s thesis/analysis is false. I have to provide more clarification on this criticism later. However, when it comes to searching for alternative ideas, I keep on running contra to your (MrKs) ideas. I fail to understand why you’re anti-exports, when it is the quickest way for a backward country to move forward. Both China and India have used that. Why can’t we? Looking within or being self sufficient is fine. But currently our people are to poor (no disposable income) to propel us from poverty. You can’t create or increase wealth from a population barely surviving. The majority of our people need welfare (surviving on $1 dollar per day) let alone having a possibility to boost the economy through spending. How else would you create wealth? Just being able to feed ourselves doesn’t make us any better than baboons of the 15th century. More importantly, to constrict people to small scale techniques – which is all one, can do given limited capital resources, is to sentence us to perpetual poverty. Economies of scale come into play the larger the area of play (market) it is. Our forefathers lost war on slavery not because they were not strong. But because Umwaarabu (Arabs/Caucasians) came with gun power - they couldn’t compete against that. Therefore, it would be suicidal or at least act as a handicap – if we failed to look outward bound. By the way, this idea of riding on top of the exports – does NOT contradict such objectives as: - adding value to our resources before shipping them out; charging taxes on profits earned or royalties to foreigners who decide to come and take a piece of our resources etc,. In other words, all you’re doing is counseling us to be careful with foreign investors. But MrK, ruling out exports can only be done at our peril. OK!